We welcome our guests in our small resort La Lucciola, who appreciate what we like so much: a rural-individual ambience with history and all comfort, plenty of rest and plenty of room for your rest. La Lucciola is 40,000 square meters: The homestead is over 100 years old and was once used for agriculture, as evidenced today by vines, olive, peach, apple, fig, kaki, pomegranate and cherry trees. The property has a pool and a lot more for fun. It offers plenty of space with plenty of sun loungers and parasols. More secluded spots invite you to be completely alone. Maybe with a thrilling book or to follow the flight of the buzzard couple and listen to the chirping of the many birds. A bowling game in the evening or a barbecue together offer a nice change. More information can be found on our Lalucciola website. 'Cascina' translates to 'little house' in English, and this is our slightly more secluded cozy retreat, especially for two, who love it romantically and would like to live completely self-sufficient. Here you even have two terraces exclusively for yourself. And in front of your door are two large house-trees, which have much to give you: From the fig tree and the cherry tree, whose lush fruits are always ripe in May, you are welcome to 'harvest' as much as you want. When the figs are ripe? When the tree throws off the first and puts it at your feet - usually in late summer Italy. If you want to do some sports, you can start this on our property with a small cross-country run (1 km circuit with a difference in height of about 50 m). If there is still enough energy available, the small paths in the surrounding vineyards offer relaxing hikes. Sporty cyclists or mountain bikers will find their challenge in the extensive hilly landscape with the well-developed roads or the small 'white' sand roads. The place Cupramontana is a typical brand village with a lot of rustic charm. The Adriatic beaches and mountains for hiking can be reached in about 30 minutes by car, as well as the city of Jesi with 50,000 inhabitants. We love the location of La Lucciola: right in the middle of "real" Italy, close to lots of places of interest, yet far enough away from the tourist bustle to really relax. Mondays is the traditional weekly market. Here you can get food of all kinds, such as fresh fruits and vegetables from local farmers, household goods, shoes, clothing and much more. If you've seen enough or even bought, you can cozy in front of one of the many bars looking for a shady spot and watching the hustle and bustle with an espresso or a glass of wine. The landlords live on site and are very happy to help and advice. Bathroom amenities include towels, bath towels, pool towels and a bath mat. The towels are changed weekly. The windows are equipped with shutters and mosquito nets. The landlord has a washing machine and a dryer available. The landlord takes over the washing for a fee of 5, - € per machine. Guests are also welcome to do their own laundry. 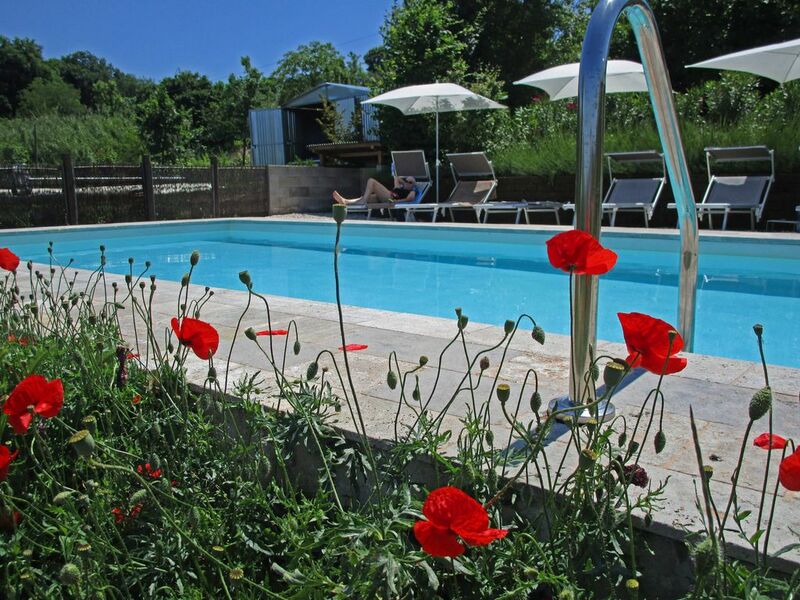 The pool is 8 x 4 m and is available to our guests. In every apartment there is a Nespresso machine. A small selection of capsules can be bought from the landlord or you can bring your favorite variety yourself. The kitchen is fully equipped with all necessary cooking utensils (blender, oven etc.). Cupramontana is a typical brand village with a historic old town and a lot of quaint charm. The Adriatic beaches in Senigallia and Sirolo and the mountains for hiking can be reached in about 30 minutes by car, the city of Jesi with 50 000 inhabitants can be reached in 15 minutes. We love the location of La Lucciola: right in the middle of 'real' Italy, close to lots of places to visit, yet far enough away from the hustle and bustle of tourism to really relax. The nature with the rolling hills, vineyards and olive groves; the caves of Frasassi; the three-day wine festival in our village; the 'Passeggiata' in the evening in Jesi, when everyone walks through the alleyways and meets for an 'Aperitivo' to chat. All this gives a wonderful opportunity for a carefree and exciting holiday.